Why? Because water retention will affect how your gown ultimately fits you. You will need to schedule your wedding gown alterations fitting to accommodate this problem. Some brides have a lot of water retention during certain times of the month. This will affect the way your wedding gown fits. So it is best to figure out ahead of time where you will be during your cycle for your wedding date. You might not know you have the problem until you are fitted for your gown. Why? Because most women are use to wearing loose fitting garments. Since a wedding dress is a close fitting garment, some find out they have a water retention problem while being fitted. Certain medications can cause people to swell up, especially hormonal and steroid medicines. If you start taking these types of medicines during the time you are planning a wedding, be aware that these will cause you some fitting problems. If you swell up only a little you probably won't have to worry so much about this. But if you are one who changes sizes, especially in the upper torso of your body and you plan to wear a strapless wedding gown . . . beware! Your dress could end up being uncomfortably tight or too loose on your wedding day. Fortunately, this is something that can be avoided. How? If you will be retaining water during the time for your wedding . . . then schedule your fittings for your bridal dress during the time you will be retaining water. This means that you need to start your fittings a few months in advance of your wedding. Make sure you are fitted during the time of the month you will be in your cycle, on your wedding day. For example, if you will be retaining fluid on your wedding day then be fitted for your wedding gown alterations that same time of the month, a month or two, before your wedding. If you are not going to be retaining fluid around the time of your wedding . . . then make sure you are fitted at a time you are not retaining fluid. Why? After reading the story below you will see why all of this is important. "This is one of those rarely revealed tips only someone who alters wedding gowns would know about. " Paying attention to your cycle has a huge affect on how your dress will ultimately fit. Plus following this tip will save you time, money and frustration! "I have had brides come in and be fitted for wedding gown alterations thinking they needed their dress let out. Then two weeks later after letting the dress out, they return for a fitting to see how the changes went before I finalize the alterations. Guess what?" "The dress was too big! And guess how much it needed to be taken in? It needed to be adjusted back to the original size. Imagine how the bride felt. Her alterations were unnecessary after all and she incurred some extra expenses she didn't need!" 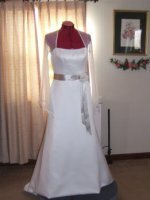 I have also had brides come in to have a hem done. Come back two weeks later and we cannot get the zipper up! They think they now need the dress let out, but I tell them to come back the next week. And when they come back the dress fits fine again. They never had a clue that they had a water retention problem. But now the problem is whether they are going to be larger on the wedding day or smaller. Some have found that if they were going to be retaining fluid they needed to have their wedding gown let out so that they will be comfortable on the wedding day. So when it comes to wedding gown alterations and water retention you need to make sure if you have this problem you need to be fitted at least a couple of months ahead of your wedding date.